Eisner was born to an affluent, secular Jewish family in Mount Kisco, New York. His mother, Margaret (née Dammann), whose family founded the American Safety Razor Company, was the president of the Irvington Institute, a hospital that treated children with rheumatic fever. His father, Lester Eisner, Jr., was a lawyer and regional administrator of the United States Department of Housing and Urban Development. His great-grandfather, Sigmund Eisner, established a very successful clothing company that was one of the first uniform suppliers to the Boy Scouts of America and his great-grandmother, Bertha Weiss, belonged to an immigrant family that established the town of Red Bank, New Jersey. He was raised on Park Avenue in Manhattan. He attended the Allen-Stevenson School kindergarten through ninth grade followed by The Lawrenceville School in 10th through his senior year and graduated from Denison University in 1964 with a Bachelor of Arts degree in English. He is a member of the Delta Upsilon fraternity and credits much of his accomplishments to his time at Keewaydin Canoe Camp for boys in Vermont. Eisner has one sister, Margot Freedman. After two brief stints at NBC and CBS, Barry Diller at ABC hired Eisner as Assistant to the National Programming Director. Eisner moved up the ranks, eventually becoming a senior vice president in charge of programming and development. In 1976, Diller, who had by then moved on to become chairman of Paramount Pictures, recruited Eisner from ABC and made him president and CEO of the movie studio. During his tenure at Paramount, the studio produced films such as Saturday Night Fever, Grease, the Star Trek film franchise, Ordinary People, Raiders of the Lost Ark, An Officer and a Gentleman, Flashdance, Terms of Endearment, Beverly Hills Cop, and Footloose, and TV shows such as Happy Days, Laverne & Shirley, Cheers and Family Ties. Diller left Paramount on September 30, 1984, and, as his protégé, Eisner expected to assume Diller's position as studio chief. When he was passed over for the job, though, he left to look for work elsewhere and lobbied for the position of CEO of The Walt Disney Company. Since the death of founder Walt Disney in 1966, The Walt Disney Company had narrowly survived several takeover attempts. Its shareholders Sid Bass and Roy E. Disney brought in Eisner (as CEO and Chairman of the Board) and former Warner Brothers chief Frank Wells (as President) to replace Ron W. Miller in 1984 and strengthen the company. Eisner brought in Jeffrey Katzenberg as Walt Disney Studios chairman. A couple years after becoming Chairman and CEO, Eisner became the presenter of The Wonderful World of Disney TV series, making him the public face of the company as well as its top executive. Although Eisner was not a performer by profession, studio management believed he could do the hosting job, after filming a test video with his wife Jane and a member of his executive team (which required multiple takes). Eisner hired Michael Kay, a director of political commercials for then-U.S. Senator Bill Bradley, to help him improve his on-camera performance. As a result, Eisner was well recognized by children at the company's theme parks who often asked him for autographs. During the second half of the 1980s and early 1990s, Eisner revitalized Disney. Beginning with the films Who Framed Roger Rabbit (1988) and The Little Mermaid (1989), its flagship animation studio enjoyed a series of commercial and critical successes. Disney also broadened its adult offerings in film when it acquired Miramax Films in 1993. Under Eisner, Disney acquired many other media sources, including ABC and ESPN. In the early part of the 1990s, Eisner and his partners set out to plan "The Disney Decade" which was to feature new parks around the world, existing park expansions, new films, and new media investments. While some of the proposals were completed, most were not. Those completed included the Euro Disney Resort (now Disneyland Paris), Disney-MGM Studios (now Disney's Hollywood Studios), Disney's California Adventure Park (now Disney California Adventure), Disney-MGM Studios Paris (eventually opened in 2002 as Walt Disney Studios Park), and various film projects including a Who Framed Roger Rabbit franchise. In 1993, Katzenberg had lobbied to become Eisner's second in command, which would have meant moving Frank Wells from president to vice chairman, to which Eisner 'replied that Wells would feel "hurt" in that scenario'. Wells died in a helicopter crash in 1994. When Eisner did not appoint Katzenberg to Wells' now available post, this caused tensions between the two that led to Katzenberg being fired later that year. Katzenberg went on to found DreamWorks SKG, with partners Steven Spielberg and David Geffen. Eisner recalled that "Roy E. Disney [Walt Disney's nephew and a force on Disney's board who Eisner says "could be a troublemaker"], who did not like him at all — I forget the reason, but Jeffrey probably did not treat him the way that Roy would have wanted to be treated — said to me, 'If you make him the president, I will start a proxy fight.'" Eisner then recruited his friend Michael Ovitz, one of the founders of the Creative Artists Agency, to be President, with minimal involvement from Disney's board of directors (which at the time included Oscar-winning actor Sidney Poitier, the CEO of Hilton Hotels Corporation Stephen Bollenbach, former U.S. Senator George Mitchell, Yale dean Robert A. M. Stern, and Eisner's predecessors Raymond Watson and Card Walker). Ovitz lasted only 14 months, and left Disney in December 1996, via a "no fault termination" with a severance package of $38 million in cash, and 3 million stock options worth roughly $100 million, at the time of Ovitz's departure. The Ovitz episode engendered a long running derivative suit, which finally concluded in June 2006, almost 10 years later. Chancellor William B. Chandler, III of the Delaware Court of Chancery, despite describing Eisner's behavior as falling "far short of what shareholders expect and demand from those entrusted with a fiduciary position..." found in favor of Eisner and the rest of the Disney board because they had not violated the letter of the law (namely, the duty of care owed by a corporation's officers and board to its shareholders). On November 30, 2003, Roy E. Disney, the son and nephew of co-founders Roy O. Disney and Walt Disney, resigned from his positions as Disney vice chairman and chairman of Walt Disney Feature Animation. His reason for resigning was his feeling that there was too much micromanagement within the studio, flops with the ABC television network, the company's growing timidity in the theme park business, the Walt Disney Company turning into a "rapacious, soul-less" company, Eisner's refusal to establish a clear succession plan, as well as the studio releasing a string of box-office movie flops starting in the year 2000. On March 3, 2004, at Disney's annual shareholders' meeting, a surprising and unprecedented 43% of Disney's shareholders, predominantly rallied by former board members Roy Disney and Stanley Gold, withheld their proxies to re-elect Eisner to the board. Disney's board then gave the chairmanship position to board member George Mitchell. However, the board did not immediately remove Eisner as chief executive. On March 13, 2005, Eisner announced that he would step down as CEO one year before his contract expired, and handed off day-to-day duties to Bob Iger, who had been serving as Disney's President and Chief Operating Officer and had been just selected by the directors as the CEO-designate. Eisner did not initially promote Iger as a successor until after the board put pressure on Eisner to resign. Eisner remarked that "I would not have agreed to [leave] if it hadn't been Bob. Because of governance, they wanted a big search and everything. … And by the end of the search, it was clear that I was able to convince the board — our newly constructed board — that Bob was great." On September 30, Eisner resigned both as an executive and as a member of the board of directors, and, severing all formal ties with the company, he waived his contractual rights to perks such as the use of a corporate jet and an office at the company's Burbank headquarters. In January 2006, Disney's corporate headquarters in Burbank was renamed to Team Disney – The Michael D. Eisner Building in Eisner's honor. On October 7, 2005, Eisner was a guest host for the Charlie Rose talk show. His guests were John Travolta and his ex-boss, Barry Diller. 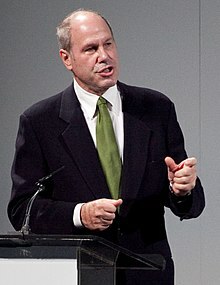 Impressed with Eisner's performance, CNBC President Mark Hoffman hired Eisner in early 2006 to host his own talk show, Conversations with Michael Eisner. The show mostly featured CEOs, political leaders, artists and actors, until its cancellation in 2009. Eisner was also an executive producer of the show. The College of Education at California State University, Northridge is named in his honor. In 2009, Eisner used his own money to produce a claymation show called Glenn Martin, DDS. He was inducted into the Television Academy Hall of Fame in 2012. In March 2017 came the revelation that Eisner was interested in a takeover of Portsmouth F.C., a football club in the south of England that had fallen on hard times before being taken over by its fans. The club released a statement on 23 March 2017 that Eisner and his Tornante Company were in an exclusivity agreement. On 3 August 2017 came confirmation that Eisner and his Tornante Company had completed their purchase for a reported fee of £5.67 million. After college in 1964, he met his future wife, Jane Breckenridge, a Unitarian of Swedish and Scottish descent. They have three sons: Breck, Eric and Anders Eisner. Received a star on the Hollywood Walk of Fame in 2008. Inducted into the Television Academy Hall of Fame on March 1, 2012. ^ "Monitor". Entertainment Weekly (1197). March 9, 2012. p. 26. ^ "Board of Trustees". denison.edu. Denison University. Retrieved August 26, 2013. ^ Orwall, Bruce (March 4, 2004). "Eisner Steps Down as Disney Chairman". Wall Street Journal. Retrieved June 6, 2016. ^ Brook, Vincent (December 15, 2016). From Shtetl to Stardom: Jews and Hollywood: Chapter 1: Still an Empire of Their Own: How Jews Remain Atop a Reinvented Hollywood. Purdue University Press. p. 15. ISBN 9781557537638. ^ a b "Michael Eisner". michaeleisner.com. Retrieved February 20, 2016. ^ "Delta Upsilon Fraternity". San Jose State University. Archived from the original on December 14, 2014. Retrieved December 11, 2014. ^ "Delta Upsilon Fraternity". University of Rochester. Archived from the original on November 20, 2014. Retrieved December 11, 2014. ^ Kim Masters (2000). "13". The Keys to the Kingdom: The Rise of Michael Eisner and the Fall of Everybody Else (2nd ed.). New York: HarperCollins. pp. 189–190. ISBN 0-06-662109-7. ^ a b Holson, Laura M. (September 26, 2005). "A Quiet Departure for Eisner at Disney". The New York Times. Retrieved October 10, 2013. ^ "The Epic Disney Blow-Up of 1994: Eisner, Katzenberg and Ovitz 20 Years Later". Hollywood Reporter. April 9, 2014. Retrieved January 6, 2018. ^ "Jeffrey Katzenberg Plans on Living Happily Ever After". Fastcompany.com. December 1, 2009. Retrieved January 6, 2018. ^ a b "Michael Eisner on Former Disney Colleagues, Rivals and Bob Iger's Successor". Hollywood Reporter. July 27, 2016. Retrieved January 6, 2018. ^ In re The Walt Disney Company Derivative Litigation , 907 A.2d 693 (Del. Ch. August 9, 2005). ^ McCarthy, Michael (December 2, 2003). "War of words erupts at Walt Disney". USA Today. Retrieved December 17, 2009. ^ McCarthy, Michael (March 5, 2004). "Disney strips chairmanship from Eisner". USA Today. Retrieved October 26, 2013. ^ "How to do CEO succession planning right, and how to do it wrong | Financial Post". Business.financialpost.com. March 30, 2017. Retrieved January 6, 2018. ^ "The Seven Dwarfs That Carry The Building". Travel Studies. Retrieved January 6, 2018. ^ Petrecca, Laura (January 10, 2006). "Eisner to host CNBC show". USA Today. Retrieved May 12, 2010. ^ Lieberman, David (September 22, 2015). "A Decade After Disney: Michael Eisner On 'BoJack Horseman', 'Star Wars', Donald Trump (And Bert Fields) – Deadline Q&A". Deadline. Retrieved October 13, 2018. ^ "Portsmouth and ex-Disney CEO Michael Eisner to hold exclusive takeover talks". BBC. March 23, 2017. Retrieved April 1, 2017. ^ National Building Museum. "Honor Award". ^ Quick, Sonya (April 24, 2008). "Michael Eisner receiving star on Hollywood Walk of Fame Friday". Orange County Register. Archived from the original on July 23, 2011. Movie mogul and former Disney CEO Michael Eisner will be honored Friday with the 2,361st star on the Hollywood Walk of Fame. The 11:30 a.m. ceremony will be attended by Eisner, Hollywood Chamber of Commerce President/CEO Leron Gubler, Walt Disney Co. President and CEO Bob Iger and actor John Travolta. His star will join other Disney figures already in place on the Hollywood Walk of Fame (please comment if we've missed one): Mickey Mouse, Donald Duck, Walt Disney, Roy Disney and Snow White. ^ Glazer, Mikey (March 2, 2012). "Chuck Lorre, Michael Eisner, Bunim/Murray Inducted Into TV Academy Hall of Fame". The Wrap News, Inc. Retrieved August 28, 2012. "Tonight, we are here to celebrate people who are not French," Jon Cryer joked as he opened the Academy of Television Arts and Sciences' Hall of Fame Induction at the Beverly Hills Hotel Thursday night. The non-French 2012 inductees are CBS sitcom king Chuck Lorre , Michael Eisner, reality pioneers Bunim/Murray Productions ("The Real World," "A Simple Life," "Keeping up with the Kardashians"), Mario Kruetzenberg (Don Francisco, of "Sabado Gigante" fame), lighting designer Bill Klages (Emmys, Tonys, Grammys, Golden Globes and the 1984 Olympics), and late "I Love Lucy" cast members Vivian Vance and William Frawley.